Age has withered her and what little history books say of her, demonises her. But Shamsiah Fakeh’s life is a fascinating story of one woman’s incredible journey from freedom fighter to communist to exiled outcast. WE had agreed to meet at her apartment. On the appointed day, I arrive at the building in Jalan Kuchai Lama, Kuala Lumpur, which is best described as dusty, thanks to the nearby construction sites. After parking and passing through an indifferent security check, I take a lift to the eighth floor. Once at the apartment, I wait with a sense of anticipation. Then a frail 84-year-old woman is wheeled out by her son. Finally, I am face to face with the legend. But as I conduct the interview I am overwhelmed by sadness. For even though I am in the presence of the once feisty former communist leader Shamsiah Fakeh, the meeting is frustrating and painful. Shamsiah, who suffered a stroke in 1999, has had a string of lung problems which have left her very weak and unable to speak. She is so frail that she has to be washed and assisted by a maid who takes her for strolls in a wheelchair. She listens to me keenly and occasionally smiles but every time she tries to speak, she ends up coughing and gasping for air. Hence, my questions end up being answered by her son, Jamaluddin Ibrahim. All this is a far cry from her days as one of Malaya’s most famous (or to some quarters, infamous) women who, along with Rashid Mydin, Abdullah C.D. and Musa Ahmad (who later defected and denounced her and the party), were among the few Malay leaders of the Communist Party of Malaya (CPM). How many women can claim to have experienced a life as eventful as that of this powerful orator who led the Angkatan Wanita Sedar (better known as AWAS, Malaya’s first nationalist women’s organisation) in agitating for independence before spending eight years in the jungles in guerrilla warfare and then nearly 40 years in exile in China? 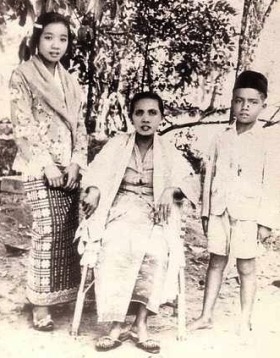 Shamsiah (left) aged 13 with her mother Sa’amah Nonggok and younger brother Haji Ramli in 1938. And how many women have had five husbands? According to her autobiography Memoir Shamsiah Fakeh: Dari AWAS Ke Rejimen Ke-10, Shamsiah, who was born in Kuala Pilah, Negeri Sembilan, was first married at 17. Her husband, Yasin Kina, was often jobless, choosing to live off his parents. He abandoned her while she was pregnant with their second child and tragically both children died in their infancy. Her second marriage to the mysterious J.M. Rusdi was also an unhappy one. It lasted just five months and after he ended it, she found out that he had been an informer working for the Japanese. Her third marriage in 1946 was to the legendary and equally charismatic leftist Ahmad Boestamam (a collaborator in the Parti Kebangsaan Melayu Malaya or PKMM, he was the head of the youth wing Angakatan Pemuda Insaf or API and AWAS was the party’s women’s wing). However she was his second wife and she left him after he failed to defend her against verbal attacks from his family. Her fourth husband, Wahi Anuwar, was a fellow CPM member who was captured by British and imprisoned. Shamsiah was told that he had surrendered and thought he was dead (he eventually spent 15 years in prison, and passed away in 1980). Jamaluddin, now 46, is a Malaysian Muslim who spent the first 32 years of his life in Communist China. Shamsiah's political awakening began during the post-Japanese Occupation period when Malay nationalism was stirring. She was still a student in Kuala Pilah when she “often attended Umno-sponsored meetings.... From there, I started becoming drawn to the nationalist movement. My enthusiasm to fight for the independence of tanah air boiled over”, she writes in her book. She also attended PKMM meetings and made her first speech at one such rally. Shamsiah explains that in the mid-1940s, there were only two Malay parties, Umno and PKMM and she was courted by both. But she decided to join PKMM because she felt was it was progressive and not influenced by the colonial masters. In 1946, she was invited to Kuala Lumpur to head the PKMM's women's wing. This was her first step on the long road that would lead her to communism – she was a member of the so-called 10th Regiment comprising Malay cadres – and eventual exile in China. In her book, Shamsiah indicates she joined the CPM because she was influenced by Wahi and Musa. I didn't know (they) were CPM members.... There was nothing unusual about them being communist. They worked wholeheartedly for Merdeka and many gave their support (to them),” she writes. All that is long behind her now. Shamsiah returned to Malaysia with her husband and sons on July 23, 1994. And in the twilight years of her life, she is content to be home, says Jamaluddin. The move was tougher for their sons who had spent their entire lives in China and had never visited Malaysia. “All three of us married Chinese women, and my mother has four grandchildren who were all born in China as well,” says Jamaluddin. Shamsiah and Ibrahim with their three sons (from left) Kamaruddin, Jamaluddin and Shamsuddin in the winter of 1964. Adjusting to life in Malaysia has not been easy for the three men. They missed their friends, the living environment and food. Jamaluddin's wife was eventually unable to cope with life here and has returned to China. Their daughter remains in Malaysia but visits her mother every year. “We are all fluent in Mandarin but it wasn't necessarily an asset for us when we first came because the language is already widely spoken here. We tried a variety of jobs. Kamaruddin worked as an art tutor and Shamsuddin got a job as a security guard. “I was importing/exporting food before going into the IT education support business. Now I have a column with China Press newspaper called A Simple Thought, ” says Jamaluddin. He has a very strong Chinese accent so, not surprisingly, he is asked about it very often. He says Malaysian Chinese still find it hard to believe that he speaks such excellent Mandarin. Upon their arrival, the family was met by Special Branch officers who took them to a resort and for about 10 days, they were debriefed and briefed on the local customs and political scenario in Malaysia. “We settled in Gombak and in the initial stages my parents' movements were monitored. My mother was invited by many universities to speak but the Special Branch didn’t allow it. “After a while, we were freed of restrictions. Last year with the re-launch of her book, many press people came to speak to her. “But over the years, she has had many visitors. Former comrades, government officials like Tan Sri Aishah Ghani (a former minister who served as an AWAS committee member under Shamsiah before joining Umno), Tun Daim Zainuddin, Tun Ghafar Baba, and also people she never met but who supported her struggle, all came to see her. 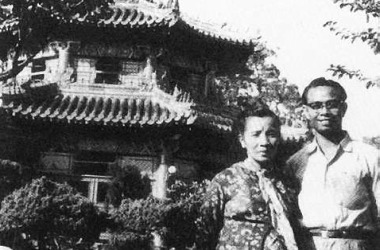 Shamsiah and Ibrahim at Bei Hai Park, Beijing, in 1957. “The response to her has been 95% positive, but there are still a few people who don’t like her,” says Jamaluddin. Indeed in her book, Shamsiah discusses a number of vicious rumours that have been circulated about her. By far the most traumatic is that surrounding the death of her third child, whom she had with Wahi Anuwar. Shamsiah was accused of killing the baby while in the jungle to avoid the risk of capture. She explains that she struggled through rain and heat, insects and leeches, thirst and hunger for her child and refused to give up. However, upon reaching an unfamiliar district, she was told by local CPM members that the baby would be given to local villagers to raise. She only found out years later that her baby was killed by those same members! After her eight-year stint in the jungle ended, she and Ibrahim moved to the relative comfort of China where they started a family. By 1956, the CPM's armed struggle had become a lost cause and the 1955 Baling Talks had failed. The CPM decided to send its top echelon led by party secretary-general Chin Peng, to China to ensure the leadership survived. Shamsiah, however, says in her book that they were sent to China ”untuk belajar” (to study) so that the Malay cadres could raise their ideological and theoretical knowledge for long-term needs. The journey to China, via Bangkok, took several months beginning in mid-1956. 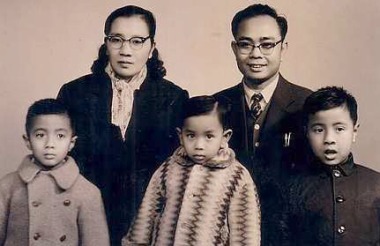 Shamsiah and Ibrahim arrived in Beijing in late April 1957. They settled there and hosted Malay language revolutionary programmes on Radio Peking. Shamsiah gave birth to their sons who were raised as Muslims and the family spoke Malay at home. This left them vulnerable to the horrors of China’s Cultural Revolution (1966-1976, now widely seen as a chaotic play for power by Mao Zedong to regain the influence he partly lost after the failure of the 1958-1960 Great Leap Forward). 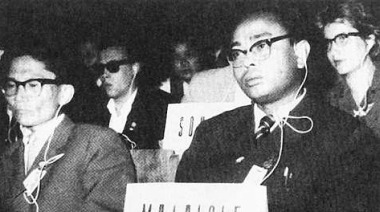 Ibrahim representing Malaysia at an international conference opposing US intervention in Vietnam held in Hanoi, 1964. “We were in Beijing in 1968. We witnessed the violence of the Red Guards. They came into the house and destroyed everything. We were confused because we supported both China's Communist Party and the CPM. “We didn’t understand why we were treated like that. Within the CPM, factions had developed – both in Malaysia and in China. It was a very bad time and my parents left the party in 1972,” recalls Jamaluddin. (In her book, Shamsiah says they were “sacked” from the party.) It was during this period that they parted ways with Chin Peng too. “My parents and he were close comrades until 1968 when they quarrelled over the issue of political policy,” says Jamaluddin. Chin Peng had suggested a period of internal criticism and Shamsiah, Ibrahim and other comrades formed a study group and submitted a report to the party. They settled in a small town called Xiang Tan, 150km from Changsa the provincial capital, where the couple were assigned to a steel factory making ball-bearings. “We were called cadres but we worked like labourers,” writes Shamsiah. By the early 1980s the urge to return to Malaysia was strong. “Our parents and us had different experiences. Malaysia was always home to them. For us sons, China was the only home we knew, even though we were slightly different from the people around us. Despite agreeing to stay out of politics – one of the conditions for her return – Shamsiah has never given up her belief that she made choices based on her principles. “She struggled for a whole lifetime, and she is very insistent that the struggle against imperialism and capitalism is a correct struggle. She considered Umno to be the subordinates of the British. The British tried to hand over power to the people who were friendly to their interests. Emergency, the situation was different. Those who went into jungle to fight, didn't change their beliefs. Independence and justice was a struggle for Malays and Muslims too,” explains Jamaluddin. 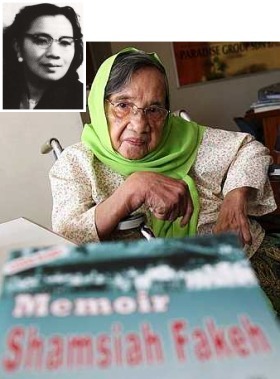 But how will history judge Shamsiah Fakeh, the most senior Malay woman communist of Malaya? Prof Datuk Dr Shamsul Amri Baharuddin, founding director of Universiti Kebangsaan Malaysia’s Institute of Ethnic Studies, believes Shamsiah was simply a radical nationalist. “During the end of the colonial era, there were many sorts of nationalist movements around the world like the Mau Mau in Kenya or the Vietnamese Communists,” he says. “In Shamsiah's case, I believe she joined the armed struggle of the CPM because the radical Malay nationalist movements like AWAS were not accepted as legal parties under British rule. While it is true that most of today’s young people don’t have a clue who Shamsiah is, she still has the ability to fascinate. IT executive Christine Claudius, 27, remembers reading about her in a Dewan Masyarakat magazine article and wondering about this woman who was never mentioned in her history lessons and young film-makers like Amir Muhammad and Fahmi Reza want tell her story (see Telling their side of history, SM5). Still, does Shamsiah have regrets about supporting a bloody struggle that cost so many innocent lives? Jamaluddin feels that his mother’s outlook is a unique one. “Some say that so many lives were lost, so you should give up the struggle. My parents' view was: How can we give up after so many have given their lives? “Revolutionary struggle means the shedding of blood and loss of life. There was a lot of sacrifice and killing on both sides. But my mother’s spirit is still very strong. At the end of the day, Shamsiah has earned a place in history. But she doesn't want to be remembered as “woman leader of the CPM”.